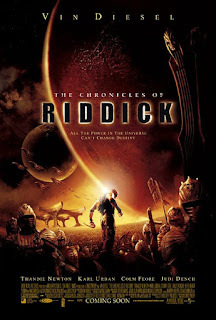 I watched The Chronicles of Riddick twenty-four hours ago, and I'm already struggling to recall what it was about. I remember wondering why the principal actor's name (Vin Diesel) sounded more sci-fi than his character (Richard B. Riddick). I remember Mr Diesel turning his head and smirking every five minutes, before charging through a dozen or so large men as though they were polypropylene skittles. Some of these monstrous bodies belonged to mercenaries, some to prisoners, some to prison guards. Most, in a film set in a gunmetal-grey meets Cro-Magnon version of the future, belonged to the footsoldiers of a planet-destroying nihilist cult with a peculiar metaphysics. Combine the toppling of these giant 'Necromongers' with Mr Diesel's talent for ironic quips delivered in a voice that's part Lee Marvin, part Barack Obama, and The Chronicles of Riddick makes for an entertaining, if instantly forgettable, two hours when you're stuck on the Oxford-Cambridge bus. It's just a pity that so much of the film looks cheap and cartoonish. The small library of books in the house of Diesel's friend in dusty New Mecca DOES look real though. It's easier to computer generate a city than a library, it seems. Unfortunately, the filmmakers spent so much on the former that they didn't have much left for the latter. I think they just moved the same set of books from one shelf to another as they filmed the scene. I must admit it had never occured to me that there was a 'supplying books for movies' trade until I noticed an entire room of books had gone from my favourite second hand bookshop, only to reappear a few weeks later. It was a little unnerving, but, as I gather, a great way for them to make money. I'm sorry to say I have not watched Chronicles of Riddick (nor played the computer game).